1 What is Kakao Account in Kakao Talk? Open the content area. 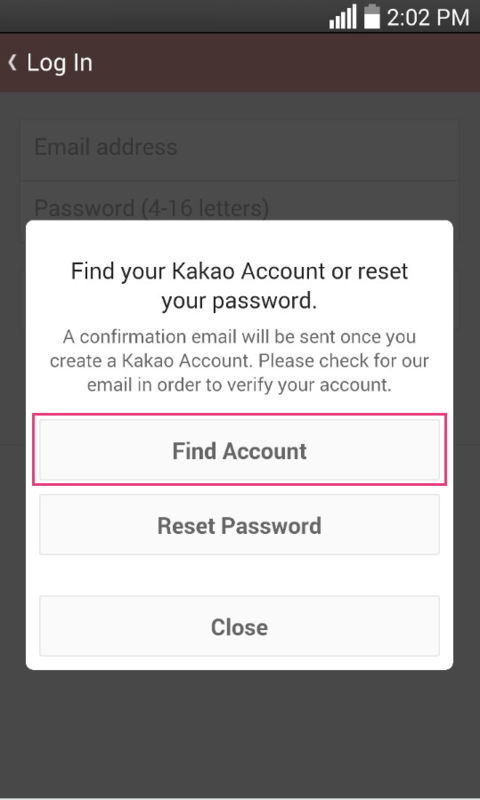 Kakao Account is an email based ID which is also used to check the subscriber of the Kakao Talk account. When you log in with Kakao Account in Kakao Talk > More, you can retrieve information previously used in KakaoTalk in case you change your phone or phone number in the future. 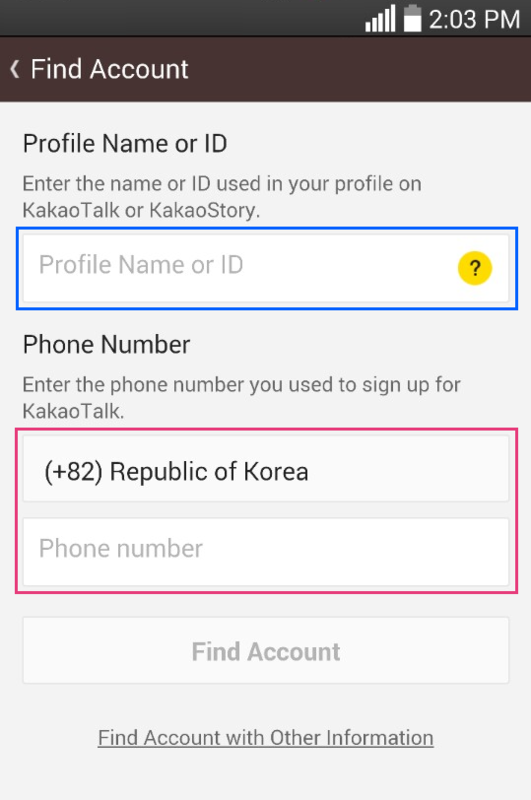 Kakao Account can be used with only one phone number. 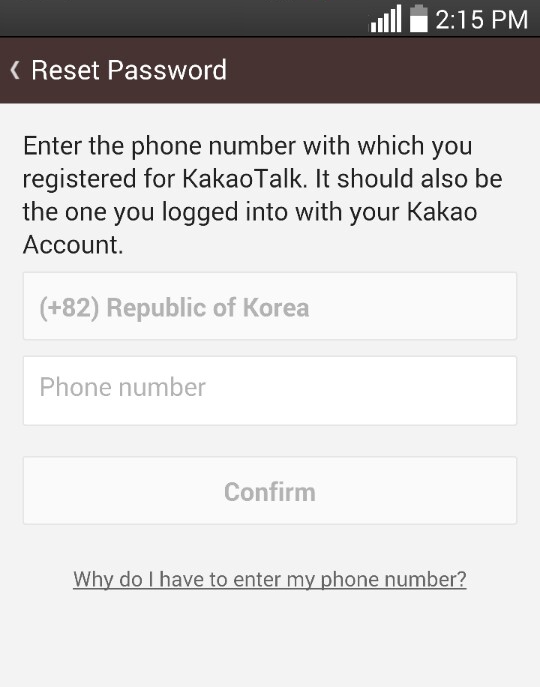 You cannot use two phone numbers with one Kakao Account at the same time. If you connect your Kakao Account with a new number, your previous Kakao Talk account will be deleted. When you go though verification with a new phone number and connect it to your Kakao Account, your previous Kakao Talk account will be deleted. 2 I can't remember my Kakao Account email. Open the content area. 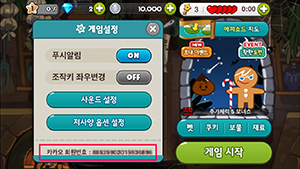 Kakao account can be found below in two different ways. - Is a Kakao Game installed on your phone? Open the app, and tap on the gear-shaped Settings icon and get the Kakao Member Number. 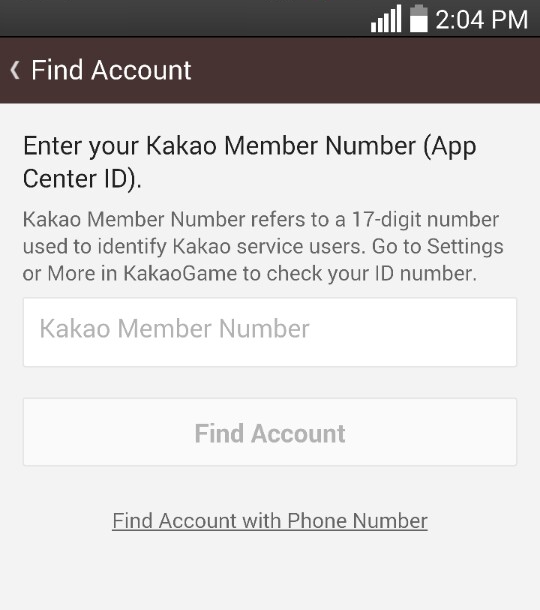 Then, enter that number in Find Kakao Account > Find Account with Other Information. 3 I can't remember my Kakao Account password. Open the content area. 4 I cannot check the verification email. Open the content area. Please check if you have entered a wrong ID or mail domain (@daum.com or @daum.met) in your email address. 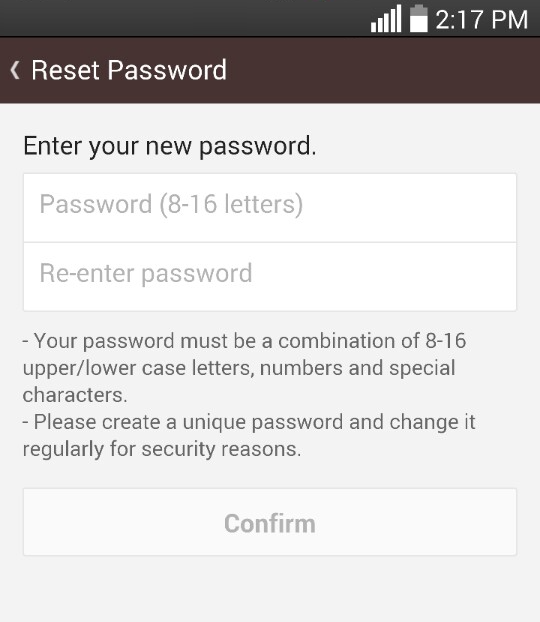 5 I tried to log into my Kakao Account from Kakao Talk and was asked to enter my previous phone number. What is the "previous phone number"? Open the content area. 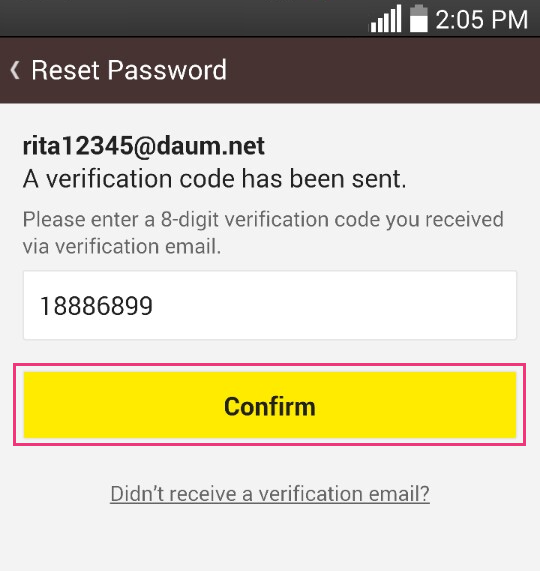 To protect your Kakao Account, you may attempt to enter your previous phone number up to 5 times. After 5 incorrect attempts, you will have to try again later. * Can't remember your previous phone number? 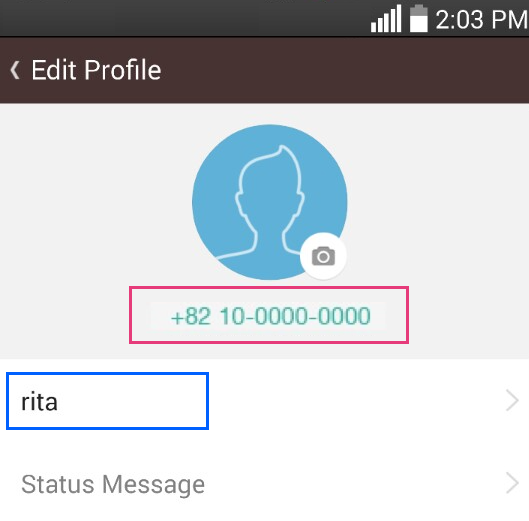 You must remember your previous phone number because Kakao can't tell you. If you don't remember your previous phone number, please check the instructions below and try again. 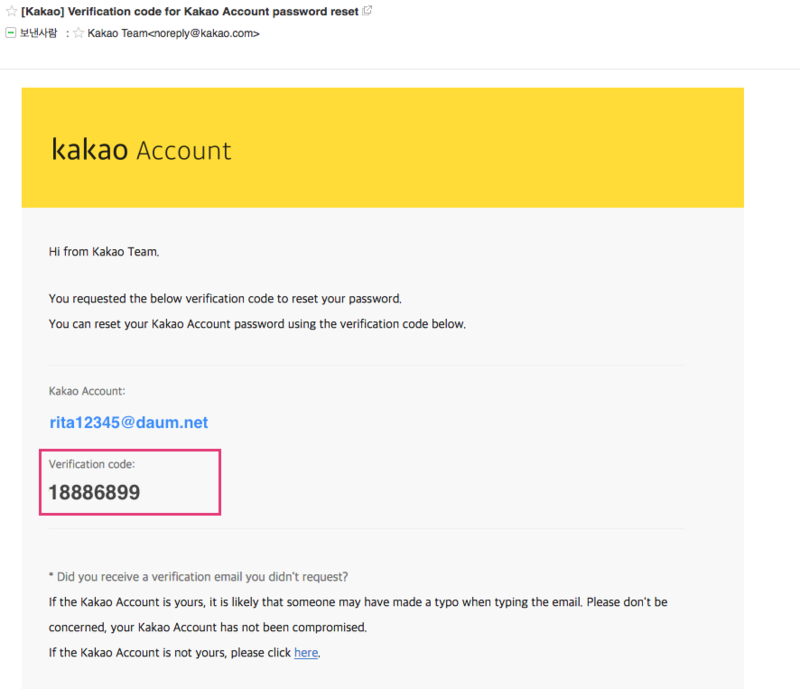 6 Can my Kakao Account be compromised? Open the content area. However, if you use the same email address and password that you use for other services or websites, that information can be hacked and your Kakao Account can also be threatened. please create a unique password that is not easy to guess, and change it regularly. 7 What do I do if I suspect that someone else has logged in with my Kakao Account? Open the content area. If you suspect that your account was logged in (or used) by someone with a malicious intent, please re-sign up for Kakao Account through phone number verification immediately, and change your password. If you are unable to log in, please contact our Customer Service to report your account as compromised. You can also click the link at the bottom of the login notification email to report account compromised or to lock your account. If an account is reported as compromised, our Customer Service can deactivate the compromised account for 7 days after a phone number verification, limiting your and other people's access to the account. Please note that you must submit a report within 14 days of the compromise. * You need to submit the account compromise report and other required documents to our Customer Service within 7 days of the account deactivation. Otherwise, deactivation will be lifted automatically. Please note that we are able to deactivate your account until police investigation of the compromised account is completed only when you submit the account compromise report and other required documents within 7 days of the account deactivation. 2. Certificate of use agreement for the mobile phone number used at the time of KakaoTalk registration (issued by the mobile service carrier). 3. Other materials which may be helpful in proving the unauthorized use of your Kakao service account by someone else. 8 Can I share or sell my Kakao Account or Kakao Game? Open the content area. Selling or exchanging your Kakao Account is strictly prohibited by the Terms of Service. If it is determined that you have sold or exchanged your Kakao Account, or made such an attempt, Kakao has a right to limit your use of Kakao services in accordance with Kakao's operations policy. We are seeing many cases of scams and account compromise resulting from the acts of selling or exchanging Kakao Accounts. Selling or exchanging your Kakao Account is strictly prohibited, and we can't provide help with any untoward incident arising out of it. Please read the following information. 1. If the seller changes mind about selling the account or sells the account with a malicious intent, not only the seller's account but also the buyer's can be disabled. Selling or exchanging Kakao Account is prohibited. Even if the buyer claims that he or she has paid money or other equivalent to buy the account, the buyer cannot claim ownership of the involved account. Please do not purchase someone else's Kakao Account, as both the seller' and the buyer's Kakao Accounts will be disabled in case the seller reports that account as compromised. 2. 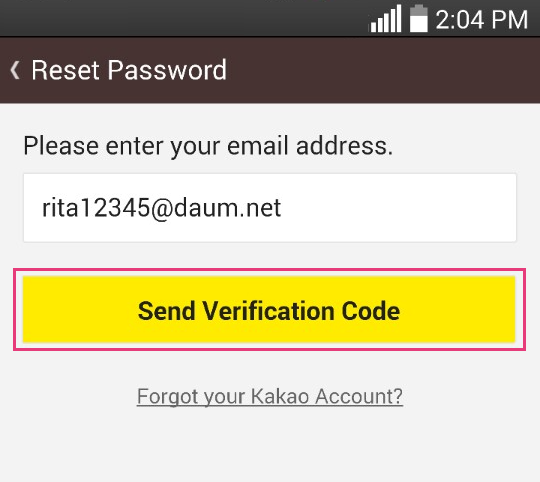 Even if the transaction is not completed, your Kakao Account may be compromised in the process. Do not disclose, even in part, your Kakao Account email, password, name or phone number to a third party. Name and phone number can be used to find user ID and password for email services such as Naver, Daum and Nate. People with malicious intents may be able to combine your personal information disclosed during the transation and guess your Kakao Account email address. Please make sure that you do not disclose your personal information even in part, such as the last few digits of your password. Do not delete your Kakao Account email even if your counterpart requests it. In some websites, when one user deletes his or her email account, another user can sign up right away using the same user ID. Your counterpart may trick you into deleting your Kakao Account email so that he or she can sign up for the same email service using your email address and steal your Kakao Account. We also recommend strongly against writing posts on account selling or exchange in open online forums. 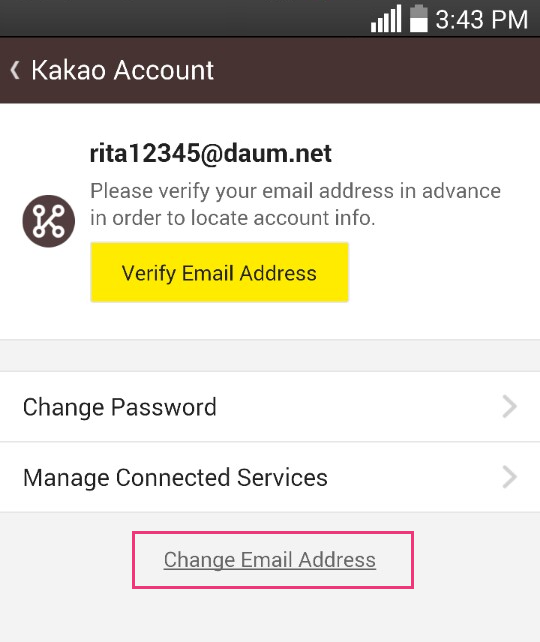 Even if you do not disclose your Kakao Account information, your Kakao Account email address can be guessed based on your ID, nickname, membeship number, etc. revealed on online communities, blogs and forums. 9 How do I delete my Kakao Account? Open the content area. Kakao Account allows you to enjoy various Kakao services such as Kakao Talk, Kakao Story and Kakao Games with one integrated account. Once you delete your Kakao Account, you can no longer use Kakao services including Kakao Story and Kakao Games. 1. When you unregister from Kakao Talk and Kakao Story, your Kakao Account will also be deleted as long as you don't have any other services linked to your Kakao Account. However, your Kakao Account cannot be deleted immediately if the deletion is likely to result in financial issues or impact to other people's use of Kakao services, even if you don't have any other services linked to your Kakao Account. * You can see the list of services connected to your Kakao Account from Kakao Talk or Kakao Story > More > Edit Profile > Kakao Account > Manage Connected Services. 2. You can also delete your Kakao Account via the Delete Kakao Account page, to which you will have access after unregistering from Kakao Talk and Kakao Story. 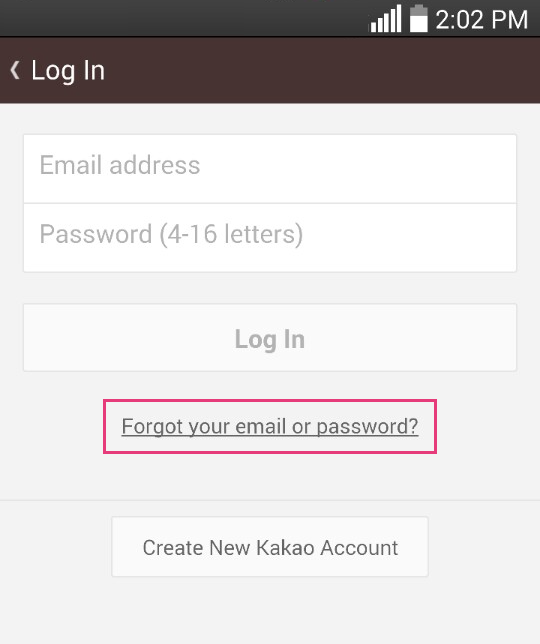 If you receive a message that your Kakao Account will not be deleted even after you unregister from Kakao Story and Kakao Talk, you can delete your Kakao Account by visiting the Delete Kakao Account page, which will be notified to you after you unregister from Kakao Talk and Kakao Story. 3. If you have already unregistered from Kakao Talk and Kakao Story, your Kakao Account can also be deleted by clicking the link below. Again, please note that your Kakao Account cannot be deleted immediately if the deletion is likely to result in financial issues or impact to other people's use of Kakao services. In this case, you will be able to delete your Kakao Account after cancelling the concerned service(s) or changing the settings. 10 More questions about Kakao Account? Open the content area. You can find more information in Kakao Account FAQ.